Janet E. Petro of Indian Harbour Beach began her professional career as a commissioned officer in the U.S. Army after graduating in 1981 from the U.S. Military Academy at West Point, N.Y., with a Bachelor of Science in engineering. She served in the U.S. Army’s aviation branch with various assignments in Germany. She also holds a Master of Science in Business Administration from Boston University’s Metropolitan College. Currently, as a member of the Senior Executive Service, Ms. Petro is the Deputy Director of NASA’s John F. Kennedy Space Center (KSC) in Florida. Appointed to this position in April 2007, she shares responsibility with the Director in managing the KSC team of approximately 9,000 civil service and contractor employees. Ms. Petro consistently pioneers and implements novel business approaches that reduce barriers to collaboration and innovation. She provides executive leadership as well as short-term and long-term vision for the Center while overseeing the Nation’s premier commercial and Government launch complex. 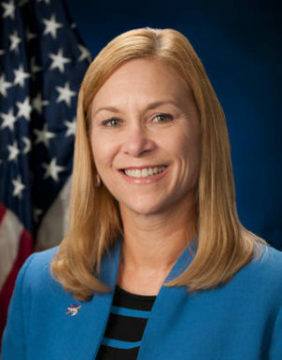 Since the successful retirement of the Space Shuttle Program in 2011, she increased her far-reaching and lasting impact on NASA’s legacy by again helping to establish KSC’s future in the American space program and transforming KSC from a Government-centered launch facility into the Nation’s premier multiuser spaceport. Ms. Petro ensured Agency and Center Partnership Boards were established, personally leading the KSC Board to explore, develop, implement, and sustain processes and other initiatives to use existing NASA capabilities, workforce, and facilities with commercial partners. Ms. Petro’s ability to establish and sustain KSC as the world’s preeminent multiuser launch complex directly supports Florida and the nation’s leadership in the space community.